Royet, J. P., Plailly, J., Saive, A. L., Veyrac, A. and Delon-Martin, C. (2013). The impact of expertise in olfaction. Front Psychol 4: 928. Penke, Z., Morice, E., Veyrac, A., Gros, A., Chagneau, C., LeBlanc, P., Samson, N., Baumgartel, K., Mansuy, I. M., Davis, S. and Laroche, S. (2014). Zif268/Egr1 gain of function facilitates hippocampal synaptic plasticity and long-term spatial recognition memory. Philos Trans R Soc Lond B Biol Sci 369(1633): 20130159. Veyrac, A., Gros, A., Bruel-Jungerman, E., Rochefort, C., Kleine Borgmann, F. B., Jessberger, S. and Laroche, S. (2013). Zif268/egr1 gene controls the selection, maturation and functional integration of adult hippocampal newborn neurons by learning. Proc Natl Acad Sci U S A 110(17): 7062-7067. Delon-Martin, C., Plailly, J., Fonlupt, P., Veyrac, A. and Royet, J. P. (2013). Perfumers' expertise induces structural reorganization in olfactory brain regions. Neuroimage 68: 55-62. Rey, N. L., Sacquet, J., Veyrac, A., Jourdan, F. and Didier, A. (2012). Behavioral and cellular markers of olfactory aging and their response to enrichment. Neurobiol Aging 33(3): 626 e629-626 e623. Veyrac, A., Reibel, S., Sacquet, J., Mutin, M., Camdessanche, J. P., Kolattukudy, P., Honnorat, J. and Jourdan, F. (2011). CRMP5 regulates generation and survival of newborn neurons in olfactory and hippocampal neurogenic areas of the adult mouse brain. PLoS One 6(10): e23721. Veyrac, A., Wang, G., Baum, M. J. and Bakker, J. (2011). The main and accessory olfactory systems of female mice are activated differentially by dominant versus subordinate male urinary odors. Brain Res 1402: 20-29. Veyrac, A. and Bakker, J. (2011). Postnatal and adult exposure to estradiol differentially influences adult neurogenesis in the main and accessory olfactory bulb of female mice. FASEB J 25(3): 1048-1057. Cheval, H., Chagneau, C., Levasseur, G., Veyrac, A., Faucon-Biguet, N., Laroche, S. and Davis, S. (2012). Distinctive features of Egr transcription factor regulation and DNA binding activity in CA1 of the hippocampus in synaptic plasticity and consolidation and reconsolidation of fear memory. Hippocampus 22(3): 631-642. Brock, O., Keller, M., Veyrac, A., Douhard, Q. and Bakker, J. (2010). Short term treatment with estradiol decreases the rate of newly generated cells in the subventricular zone and main olfactory bulb of adult female mice. Neuroscience 166(2): 368-376. Bovetti, S., Veyrac, A., Peretto, P., Fasolo, A. and De Marchis, S. (2009). 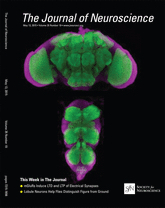 Olfactory enrichment influences adult neurogenesis modulating GAD67 and plasticity-related molecules expression in newborn cells of the olfactory bulb. PLoS One 4(7): e6359. Veyrac, A., Sacquet, J., Nguyen, V., Marien, M., Jourdan, F. and Didier, A. (2009). Novelty determines the effects of olfactory enrichment on memory and neurogenesis through noradrenergic mechanisms. Neuropsychopharmacology 34(3): 786-795. Veyrac, A., Nguyen, V., Marien, M., Didier, A. and Jourdan, F. (2007). Noradrenergic control of odor recognition in a nonassociative olfactory learning task in the mouse. Learn Mem 14(12): 847-854. Veyrac, A., Didier, A., Colpaert, F., Jourdan, F. and Marien, M. (2005). Activation of noradrenergic transmission by alpha2-adrenoceptor antagonists counteracts deafferentation-induced neuronal death and cell proliferation in the adult mouse olfactory bulb. Exp Neurol 194(2): 444-456. Veyrac, A., Giannetti, N., Charrier, E., Reymond-Marron, I., Aguera, M., Rogemond, V., Honnorat, J. and Jourdan, F. (2005). Expression of collapsin response mediator proteins 1, 2 and 5 is differentially regulated in newly generated and mature neurons of the adult olfactory system. Eur J Neurosci 21(10): 2635-2648.